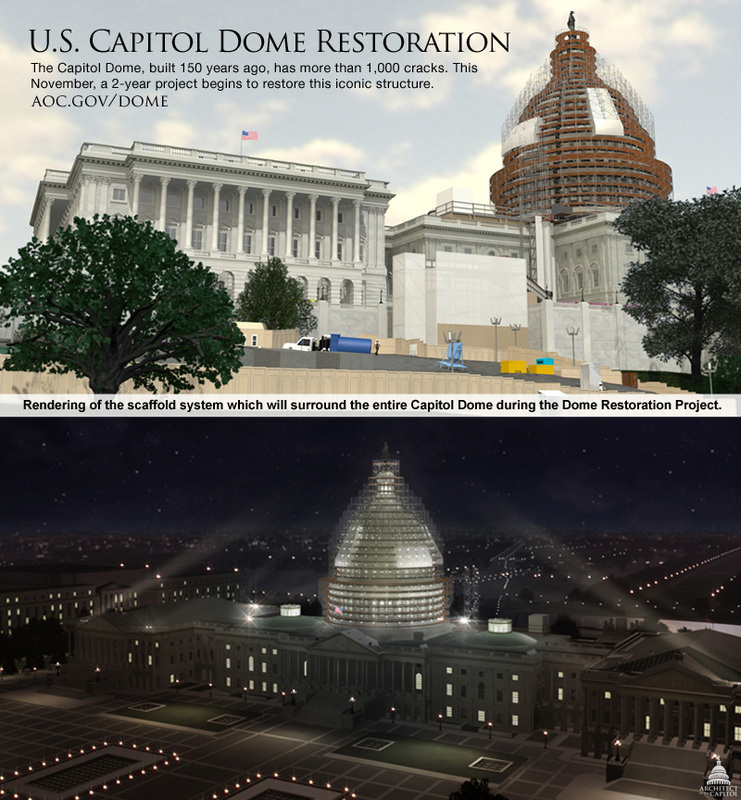 Rendering of the scaffolding that will surround the dome during its restoration. There’s been so much scaffolding recently in Washington D.C. that it looks like the capital is recovering from an incredibly ruthless alien invasion, a knock-down drag-out superhero brawl, or some other action film-level disaster. In a city as widely visited as Washington D.C., a city where it seems that even structures of the smallest import are national landmarks, it’s not exactly desirable to have the monuments, memorials and buildings concealed behind wood and metal cages. In cities such as New York or Chicago, where change is the norm, scaffolding is a part the city fabric, but in a city where history is the major draw, where there are certain structures that visitors feel they have the inalienable right to see, scaffolding poses something of a problem. 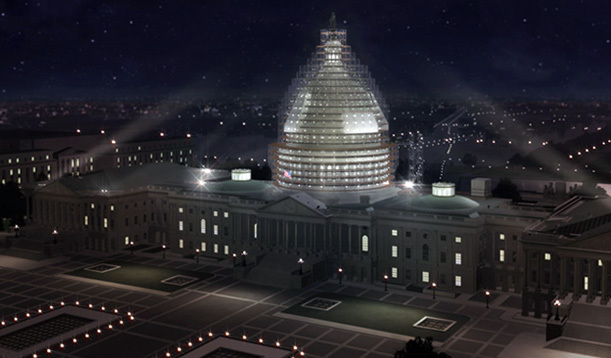 As a result, D.C. architects have gotten creative. 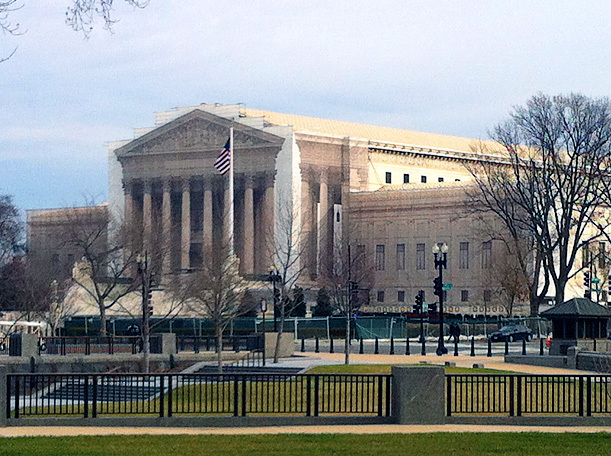 The printed scrim in concealing the scaffolding in front of the Supreme Court Building. The white Vermont Imperial Danby marble building has been completed repaired and cleaned with a process that uses technology similar to dermatological lasers. Please excuse my low-res photo. At the end of September, scaffolding was removed from the western facade of the Supreme Court Building after a complete restoration. But during the year that the building was covered, visitors were still able to enjoy Cass Gilbert’s design thanks to a scrim printed with a full-size image of the marble facade. It’s a common practice in Europe that’s starting to be seen more frequently in the U.S., as also illustrated by the recent scrims on Independence Hall in Philadelphia and on the Plaza Hotel in New York City. The Supreme Court scrim was so well done that from a distance I didn’t even notice it at first. While the image lacks the depth and complexity of the original, for tourists hoping to snap a picture, fake can be just as good – and just as functional. It’s fascinating to me that what is essentially a big billboard can act as a proxy for a building (or, as in Hong Kong, an entire city skyline). After all, dating back to at least Ancient Greece, building facades have acted as signs denoting the function or purpose of the structure. Scaffolding designed by Michael Graves & Associates circa 2000. Interested in the specifications for the dramatic structure currently enshrouding the Monument? Check this excellent graphic from the Washington Post. A different approach was taken with the scaffolding now surrounding the Washington monument, which has been closed to visitors since the structure was damaged by a 5.8 magnitude earthquake in 2011. The $15 million repair should finish up next spring, and until then the iconic monument will be enclosed in an impressive feat of architecture and engineering that beautifully illuminates the obelisk every night. This isn’t the first time the Washington Monument has been covered with illuminated scaffolding. In fact, the current scaffolding is nearly identical to the system designed by architect Michael Graves & Associates that was used for two years during the monument’s 1998-2000 restoration. MGA’s scaffolding mimics not only the shape of the monument, but is enclosed in a translucent mesh patterned with an exaggerated image of its stone and mortar joints. The architecture of Washington D.C. tells the story of America. Scaffolding is an inevitable part of maintaining our history and ensuring that story is told for centuries to come. It can be unsightly and inconvenient, but in the right hands, with the right motivation, the scaffolding-covered monumental architecture of D.C. continues to communicate the ideals that inspired the nation’s founders. This article originally appeared on Design Decoded. Next PostNext On Preservation, Progress, and Penn Station.